If you do not have the luxury of a few square meters of soil, there are plenty of possibilities to grow vegetables on your balcony. Some crops like the warmth and shelter even more than the cold earth. Other advances are: the ability to guide your plants closely; having them near the kitchen (a fresher meal is not possible); and normally mice, rabbits and most insects will not reach your plants (be aware of pets, though). Next to the presumed pots on the ground, you can hang pots on the wall, on the railing and grow climbers against the wall and above the windows by using racks. Without a lot of space, working in layers is a good option. This picture shows the different possibilities described above. We recently turned over our balcony, so the plants do not cover the whole wall yet. When growing vegetables on your balcony, you have to take in mind that big crops are not possible because there is not enough space to create adequate roots. In the superficial balcony boxes (on the right side in the picture) you can grow vegetables such as spinach, radishes, lettuce, rocket, and all kinds of kitchen- and tea herbs (chamomile, mint, marigold). In bigger pots you can even grow the more 'exotic' or warmer crops such as eggplant, paprika, tomato and pepper. Protected by wind, and with the extra warmth from the walls, you can easily create a tropical atmosphere for them. 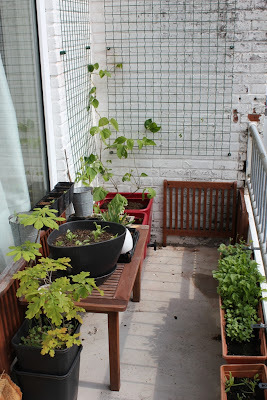 Having four pieces of wall on our balcony, we took advantage of it by placing all kinds of racks for climbing plants. The good thing is that most climbers have beautiful flowers as well, think of peas, kiwi, runner beans, Indian cress and caigua. Those last three are all doing great on our balcony. Furthermore you can keep plenty of herbs, flowers and small crops in vertical rows of bags on the wall, or cover your wall with small hanging pots (also called 'vertical gardening'). It saves so much space! On the most difficult reachable places you can construct a hanging basket. A perfect edible hanging plant is strawberry. You can hang the plant higher up; the strawberries will hang down the sides of the basket. No more excuses for too little space for vegetables on your one square meter balcony!